Middlebury opens the NCAA Tournament this evening at home against Curry College. Curry went 21-7 during the season, and 15-3 in the Commonwealth Coast Conference (CCC). While the CCC isn’t the most difficult conference to win, Curry proved over the course of the season that it could play with some of the best teams in the Northeast region. Just a year removed from a 29-point beatdown received at the hand of Middlebury, the Colonels demonstrated that they could play with the upper echelon of teams in the NESCAC and the NEWMAC. Curry lost 4 of its first 7 games of the season, but the losses came against Amherst (117-96), WPI (83-76), MIT (71-63) and Williams (97-93). The followed four tough losses with an 81-78 win over Wesleyan at home. As you can tell, Curry can score the basketball. The Colonels averaged 81.5 points per game on a .482/.402/.715 (FG/3PT/FT) line for the season. Bad offensive teams that play at a fast pace often average a lot of points. What that line tells you, however, is that isn’t the case for Curry. The Colonels offensive numbers compare favorably to Middlebury’s offensive totals: 79.6 points per game on .496/.390/.739 shooting stats. And while Middlebury played better competition over the course of the season, Curry demonstrated that they can be just as explosive offensively against the top competition Middlebury played against. Sedale Jones averages more than 22 points per game and scores in various different ways. These two teams played as recently as December of 2011. Middlebury won that game 83-54. Unfortunately, that tells us very little about today’s game. Then, Curry was 2-6 and headed for an 11-15 season, 9-9 in CCC play. Only 2 of Curry’s current top-6 rotation players played real minutes in the game, and Middlebury received 22 points from Ryan Sharry on 8-11 shooting from the floor. Since then, Curry has evolved into a dangerous offensive team, led by three talented scorers. Sedale Jones — recently named the CCC Player of the Year — Lambros Papalambros (a 1st Team All-CCC selection) and AJ Stephens (second team) combine to score 55 of the team’s 81.5 points per game. In three games against NESCAC teams this year, Jones is averaging 32.7 points per game on .561/.500/.793 shooting splits. He is a Division I talent and appears to play his best game against the best competition. Perhaps even more intriguing than Jones is Lambros Papalambros. In 28 games this season Papalambros is averaging 16 points per game, 4.5 rebounds and 3.9 assists. At 6’4” he’s taller than your average Division III point guard, and a better shooter too. The Massachusetts native shoots 52.6% from the floor and 42.3% from beyond the arc. Rounding out the top three is AJ Stephens, a 6’5, 255-pound bruiser, who has a similar build (though admittedly wider) to Middlebury’s 6’6”, 215-pound Peter Lynch. At first glance Stephens looks like a (considerably) more skilled version of Weselyan’s Glen Thomas. Stephens averaged 16.9 points per game and 9.9 rebounds while shooting 54% from the field. Does Curry have the right ingredients to pull off an upset? In last year’s upset loss to Scranton, Middlebury had difficulty guarding the Royals’ bigger guards who went into the post against the Panthers’ smaller trio of Thompson, Wolfin and Kizel. The Colonels run a similar three guard set with Jones, Papalambros and Carlos Ribeiro. While Ribeiro is just 5’10” the other two are both 6’4” and shoot a high percentage from the floor. Last week Williams took advantage of Taylor Epley’s height advantage over Nolan Thompson and used their 6’4” forward to post up Middlebury’s Defensive Player of the Year, with far more success than when the Ephs attempted to run Epley off screens and play a primarily perimeter game in the first meeting. 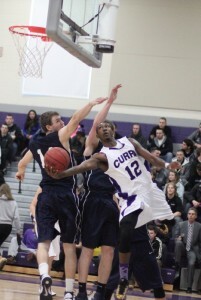 Curry has the size on the perimeter to take Middlebury out of its defensive comfort zone. The Colonels can play with the top tier of teams in the country, but sticking with teams and beating teams are two very different things. If Curry beats Middlebury ti will be the result of making small adjustments (like going into the post more) and getting help from a poor Middlebury shooting night. Offensive discipline: As already noted, Curry will have to play disciplined basketball to beat Middlebury. Sedale Jones will need to have an efficient shooting night, which will be difficult with Nolan Thompson guarding him (more on this in a minute). Jones will need to facilitate, and limit his turnovers. Jones has done a good job getting his teammates looks this year (3 assists per game) but has tuned the ball over 95 times this season (3.4 per game). With Thompson guarding him, a 30-point outburst from Jones is unlikely. But if he can make the most of his limited looks and find teammates for better looks, he will do more for his team’s win probability than if he enters this game looking to replicate what he did against Amherst and Williams (75 combined points). It will be very interesting to see what his mentality is early in the game, whether he’s looking to find his own shot against the best perimeter defender in the country or if he tries to find his teammates. Foul trouble: This concerns both teams. For Middlebury, keeping Lynch on the floor and out of foul trouble will be vital. The Panthers’ leading scorer averages just 24 minutes per game because he has been forced to sit for long periods of time due to foul issues. Staying out of foul trouble is a much bigger concern for Curry, however. The Colonels’ rotation only goes 7 deep as two of their senior contributors off the bench, 6’7” center Ted Amendola and 5’11” guard Eric Gugliemello haven’t played in over a month. Jones, Papalambros and Stephens will have to be disciplined on both ends of the floor, as Middlebury does a great job drawing charges defensively and will look to enter the ball inside to Lynch and big Jack Roberts early and often. Middlebury’s past shooting woes: Over the last four years Middlebury has lost 13 total games. In those 13 losses, Jake Wolfin and Nolan Thompson have combined to shoot 33% (84-252) from the floor and 28% (38-135) from beyond the arc. This isn’t to assess blame — or anything close to it — for those losses, but to suggest that when the Panthers miss open shots — and Wolfin and Thompson are most often the recipients of open looks — they struggle to win games. In those losses, Wolfin shot better than 50% or better from the floor once and Thompson twice, without any overlap. Given that only 4 of the 13 losses (and none of the past 9) were decided before the final minute of regulation, missing open looks for Middlebury has proved incredibly costly. The Thompson Effect: The Middlebury seniors have only lost three times at home in their careers, and have never been ousted in the opening round of the NCAA Tournament. And while Curry provides challenges for the Panthers, they share many of the same qualities (one dominant perimeter player, offensive-minded, poor depth) with teams that have struggled immensely against Middlebury. Thompson plays a huge role in this, as his ability to shut down dominant perimeter scorers can stall an entire offense if the offensive system is built primarily around that player, or two or three guys. In last year’s second round game against Albertus Magnus, Nolan limited Darius Watson (a guy’s whose stats this year look eerily similar to Sedale Jones’s) to 11 points on 5-16 shooting, though most of those came in garbage time once the game was out of hand (Watson had 0 at half-time and had attempted just 3 shots). The year before that, in the opening round of the tournament, Nolan held Western Connecticut State’s DaQuan Brooks (he of the 45-point second half) to 11 points of 5-13 shooting in another Middlebury blowout. Curry’s defensive struggles: Peter Kaasila and Michael Mayer combined to score 48 points on 17 of 24 shooting from the floor. Curry’s center Ted Amendola played in both of those games, but has not played since January 31st. Lynch scored 13 points on perfect 6-6 shooting in the game between these teams last year while Sharry finished 8-11 (as noted above). Given the success of the Kaasila and Mayer, Lynch should be able to take advantage of space to operate, much like he did against Williams last weekend, when he scored 23 points and pulled down 12 rebounds while shooting 10-17 from the floor. Middlebury’s track record: Over the past four years the Panthers are 55-0 against everyone in the NESCAC not named Williams or Amherst. They have routinely dominated lesser competition, and though Curry has the talent to be a middle-to-upper-tier NESCAC team, it is exactly that kind of team that the Panthers have owned, particularly at home.